IT WAS love at first bite for long-established city dwellers Shannon and Megan Scott. After enjoying many a weekend in the South Burnett, they fell in love with the area, chose to marry there and so their future unfolded. Spending their wedding night at the gorgeous Deshons Retreat, they read in the local newspaper the next morning that Taste South Burnett was for sale. Their honeymoon in Fiji was consumed with checking sales figures and within weeks they had bought the combined cellar door cafe and function centre, resigned from their jobs in Brisbane, bought a house and relocated to Kingaroy. The decision is clearly one they do not regret. In fact, they thrive on the country lifestyle. Stocking a huge variety of wines, cheeses, fudge and other local products, Shannon and Megan are as enthusiastic now as they were in June 2010. 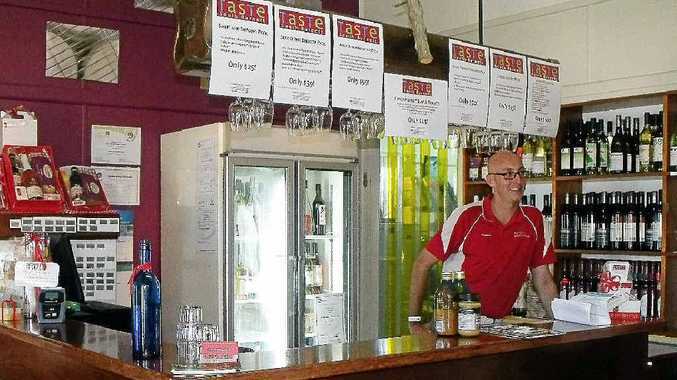 Offering light lunches, wine tastings and coffee at their shop by the old Kingaroy Butter Factory at 67 William St, Kingaroy, the location is perfect to sit, enjoy, relax and take in the country hospitality on offer. On my visit, Shannon prepared a fantastic platter to sample many of the local delights. The Bunya Black, otherwise known as ash brie, is one of the local cheese specialities. Teamed with Kingaroy Kitchen dukkah, Kumbia dill pickles, olive oil made next door by Proteco Gold alongside kabana smoked by Shopping World butchery, this was a real local tasting with each delicious morsel complementing its neighbour. Shannon and Megan are a wealth of knowledge on the region. The casual tables and chairs on the balcony overlook the park: a perfect spot to while away the afternoon enjoying the peace and quiet while savouring locally sourced goodies including a wide selection of wines. Verdelho is the grape of choice here. This regional white grape grows well due to the climate and the age of the vines. "It can be distilled into a dry or a sweet wine. It's very versatile," Megan said. Speaking of alcohol, the liquor duo nicknamed Crazy Cowboy (because it is a little bit nuts) is also very popular. The liqueur consists of butterscotch and also a peanut liqueur which Shannon describes as Baileys with peanut butter. At 18.5%, only a small amount over crushed ice is all that is needed. Of course if you prefer something alcohol-free, try some of the fudge Shannon prepares each week. Producing between 15 and 20 flavours, Megan tells me the caramel and vanilla swirl is their top seller. A visit to the South Burnett region is well worth the two hours drive from Brisbane or the Sunshine Coast. The writer was a guest of Toowoomba, Golden West and South Burnett Tourism and Tourism Queensland. Contact: Shannon and Megan 07 4162 8222 or visit: Taste South Burnett.